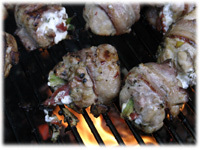 This is one of our websites all-time favorite grilled chicken thigh recipes, mostly because of its full-flavored marinade and the smoky bacon wrapping. Another reason is the dark meat of the thigh always stays moist and grills quite quickly so they're perfect for this type of recipe. 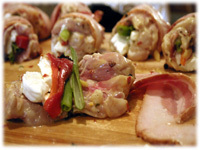 The goat cheese blends perfectly with the roasted red pepper and green onion to make a creamy stuffing that oozes out as you cut into each bacon-wrapped thigh. And if you're in a hurry this is one of those recipes that are great for a fast weeknight meal. 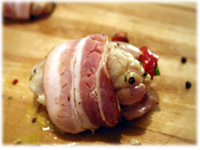 We usually wrap these in bacon but you could also use pancetta bacon or prosciutto just as easily. The chicken thighs are marinated in a zesty lemon-olive oil mixture that really enhances the stuffing flavors. And this grilled chicken thigh recipe pairs perfectly with these prosciutto wrapped asparagus spears. 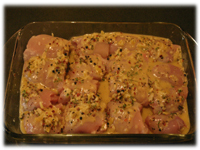 In a glass bowl or sealable glass jar mix the ingredients for the marinade well. Place each chicken thigh side-by-side in a glass dish and pour the marinade over the pieces, turning at least once to ensure all sides are covered. Cover the dish and refrigerate 2 to 8 hours (while you're at work!). Oil the BBQ grates well and preheat the grill to 475F - 500F. Remove the chicken from the refrigerator. Unroll several pieces and place them on your working surface. Place 1 tablespoon of unripened goats milk cheese near one end of the chicken thigh. Place a piece of flame-roasted red pepper on the cheese and 1 piece of 3" green onion beside it. 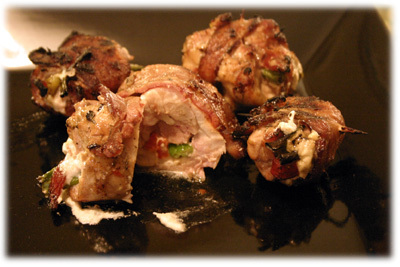 Roll each piece of thigh up and wrap a piece of bacon around it, secured with a toothpick. Variation: These chicken thigh recipes are usually wrapped in bacon but you can also try wrapping with pancetta or proscuitto instead. 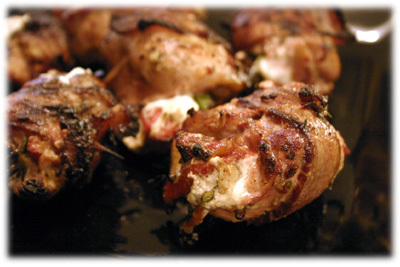 Place the bacon wrapped pieces on the preheated grill and close the lid. After 8 - 10 minutes lift the lid and flip the pieces over if they're showing nice browning and grill marks on the bacon and chicken. Some of the goat cheese may slightly leak out but most of it remains inside. After another 8 - 10 minutes lift the lid and check on the thighs. They should be done after 20 minutes but if you can insert an instant read thermometer in the meat (not stuffing) and get internal temperature of at least 165F then remove the chicken. Cover and let rest 5 - 10 minutes before serving.